Hospitals are not what exactly come to mind when one thinks of scary stories, right? One would more likely think of places like cemeteries or haunted mansions. But seeing how a high number of people die in hospitals, either due to medical complications, lack of proper med care or negligence, it should not come as a surprise that lots of ghosts haunt hospitals as well. 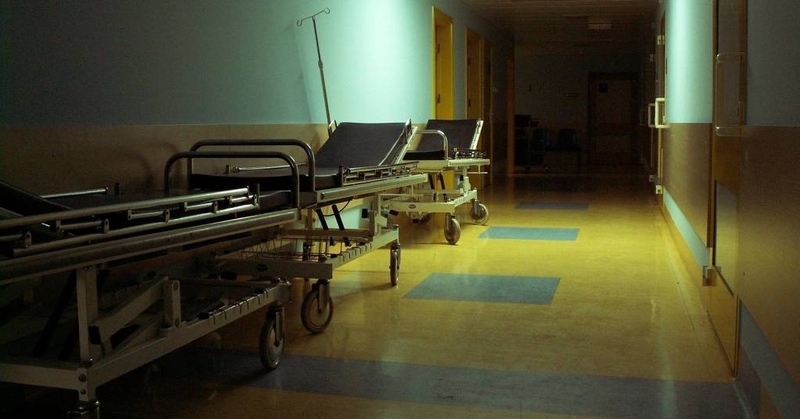 We scoured the internet for horror stories, and here’s our compilation of the best short scary stories happened in hospitals out there. "You want scary stories? Okay. So this happened when I was 21." recalls 56-year-old Anne Jismah. "My best friend had to get some stitches on her forehead and I was getting bored, so I decided to explore the hospital she was in. I had crossed only 2 rooms when something in the 3rd one caught my eye. This girl, who couldn’t have been more than 7, was lying on a hospital bed with dozens of medical tubes going inside her body. And right then, I saw a black shadow hovering over her for maybe 4 seconds. I rubbed my eyes and the shadow was gone. But so was the girl! The monitor started beeping because her heart rate had flat lined, and to this day I still believe it was the Reaper who was sucking in her soul, taking it away to God to be judged." So this hospital in Montana became quite popular in the 50s because of this lady in red clothes who would constantly be photographed in pictures. Her face was never visible and she would always be standing away at a distance, appearing to be observing what’s happening. None of the nurses could ever recall having seen her face to face, yet she would constantly show up in all photos up until 1987 when it all suddenly stopped. Nobody knows why. One ex-nurse recalls an incident from the hospital she was working at, which forced her to quit her job. She was in charge of an old man whom she identified as only Mr Mallory. The old man had Alzheimer’s and the nurse would often find him walking the corridors of the hospital, aimlessly. He was in for gall bladder removal and one day (after a week away from work), she found him in the elevator. As always, she took his hand and guided him to his room. At the end of the shift, she asked the receptionist to keep an eye on Mr Mallory till the next nurse came in, and the receptionist’s reply shocked her. "What are you talking about? Mr Mallory passed away 3 days ago." How’s that for the list of scary hospital stories? 27 year old Jackson Summers recalls one of the scary hospital stories he can think of. It was the death of his Grammy when he was 13 years old. He said, "She was surviving on machines for some time and one day her body finally gave way. We were asked to reach the hospital to pay our respects to her. Now my allergies were acting up and while all the adults were outside the room, I was sitting beside Grammy. Then suddenly, I sneezed 5 times continuously and I heard someone whisper 'Bless you' behind me. Shocked, I immediately turned around to see.... a shadow of an old man in a top hat with steely red eyes. I got so scared that I ran out of that room and never looked back. It’s the reason why I never visit hospitals anymore." This one old hospital in Breckenridge was notorious for being haunted. Room #6 was always locked because 3 patients had died one after the other in that room, and authorities thought it's best to keep it locked than to face another suspicious death. Nurses and doctors who worked there swore they would always hear scratching on the door, like someone was trying to burrow a hole through it. The door knob would also turn by itself, but the scariest thing was that this happened every alternate Fridays, starting exactly at 1:04am and ending abruptly at 1:09am. Galen is a small town in Illinois which has a very small number of emergency rooms. It’s famous for the Red Haired Doc, a lady doctor who would wear blue overalls and a white coat, would mysteriously appear during surgeries and would stand in the corner of the surgery room, just watching. Only the lead surgeon would be able to see her and within the next 4 hours, the death of the patient was imminent. Till this day, nobody knows who she is and what she wants, but her presence undeniably means that the Grim Reaper is not far behind. Over the past decades, many surgeons tried to have a sketch artist draw her face, so that she could be searched in government record. But they failed every single time because not a single one of them would be able to recollect what she looked like. It was almost as if she wiped their memories after she disappeared from the surgery rooms. Server responsed at: 04/25/2019 8:02 p.m.